Buttery, soft lettuce leaves concluding in a crunchy stem are the defining feature of butter lettuce, a loose-leaf lettuce in the butter head family (other family members are Boston lettuce and Bibb lettuce). 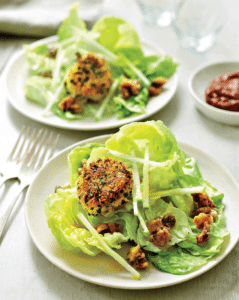 Though its leaves are tender, butter lettuce holds its own with substantial add-in ingredients, like the goat cheese that’s breaded and fried into creamy, crisp deliciousness and set atop the finished salad. Add walnuts, granulated sugar, and butter, stirring frequently until the butter melts and the nuts are well coated. TRANSFER to a baking sheet lined with parchment paper and use a fork to separate the nuts right away. Allow the coating to harden, 5–7 minutes. IN a small bowl, combine the lemon juice, Dijon mustard, and shallot. Slowly whisk in olive oil. Season to taste with salt and pepper. Set aside. IN a mini food processor or spice grinder, pulse the breadcrumbs until finely ground. In a medium bowl, Combine the breadcrumbs, chopped parsley, and chopped chives. REMOVE the goat cheese from the refrigerator. With an ice cream scoop or a tablespoon, scoop ¼ cup of goat cheese. Place the flour in a bowl and season with salt and pepper. Place the egg in another bowl and beat lightly. Using a fork, flatten the goat cheese slightly to form a disk and toss it in the flour. Then coat the disk with beaten egg and roll in the breadcrumb mixture until evenly coated. Set the croquette aside on a clean plate and repeat with the remaining goat cheese. When all the croquettes are breaded, cover loosely and refrigerate for 30 minutes. HEAT about ¼ inch of canola or grapeseed oil in a small skillet over medium-high heat. Gently add the chilled cheese croquettes. Fry until golden brown, ½–1 minute per side. Transfer to paper towels to drain. PLACE ¼ of a head of butter lettuce on each plate. Top with a goat cheese croquette and drizzle the lettuce and plate with the vinaigrette. Garnish with apples and walnuts and a dollop of apple butter.